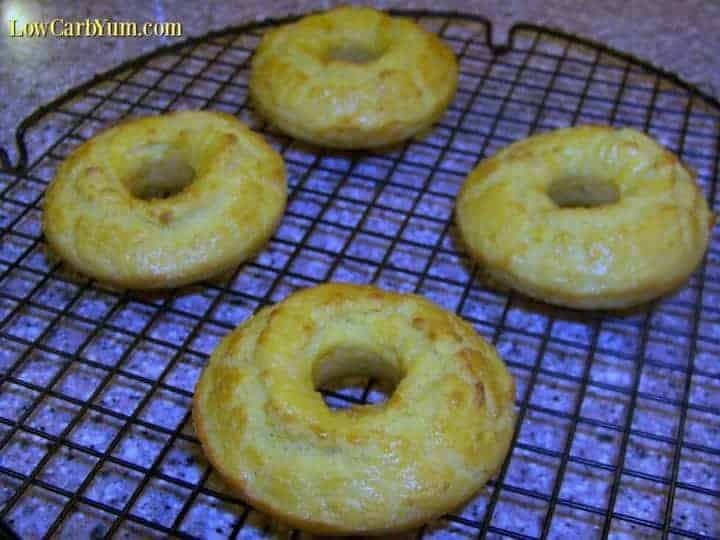 These homemade gluten free low carb garlic coconut flour bagels are much cheaper than buying pre-made ones. They taste delicious too! It’s been over a week since I’ve posted on the blog. The main reason is that I just haven’t been eating much food while working towards a weight loss goal. I am happy to say that I exceeded my goal. I managed to lose an average of two pounds a week by making a drastic cut in calories and exercising thirty minutes a day. Now that I am down to where I want to be, I’m slowing adding more calories to enter into maintenance. I could stand to lose a couple more pounds. But anything more than that could be too much too fast. I’m happy with my weight now, but I’ve got to keep an eye on my food intake. I have had a serious craving for bread lately. There’s a guy at work who is always toasting a bagel in the toaster by my desk each morning. That’s why I made up some low carb coconut flour bagels. While downing my morning low carb protein bar or shake, all I could think of was sinking my teeth into a warm buttered garlic bagel. I’m doing really well with my weight loss plan. Giving in to my cravings will only make things worse. And, I don’t want to gain back the pounds I worked so hard to shed. 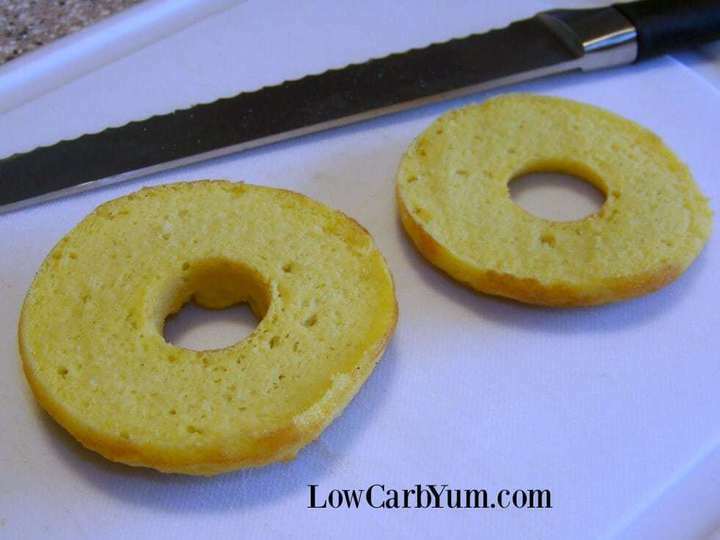 Now that I’m back to eating more, I thought I’d try a simple coconut flour bagels recipe in a donut pan in order to make “mock” low carb coconut flour bagels3. 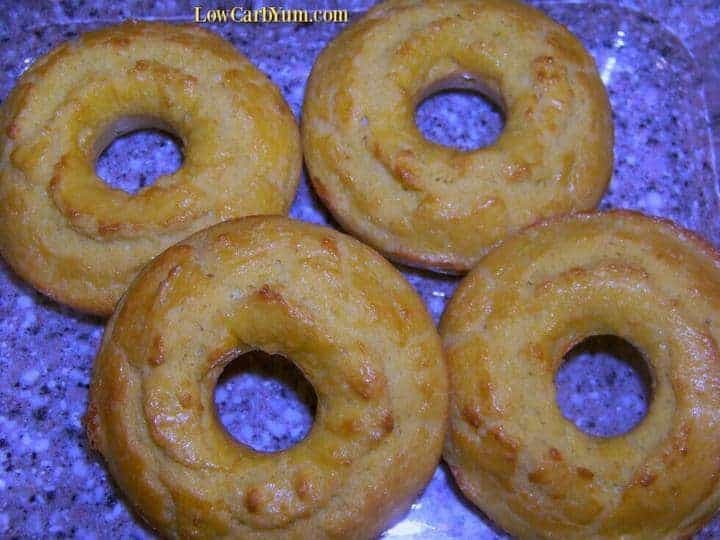 This garlic bagel recipe is really just a quick bread baked into a donut shape. I think adding in some psyllium husks may give the bagels more of the traditional texture. I was really surprised at how well these low carb bagels came out since it was a cinch to throw them together on the spur of moment. I hope you enjoy them as much as I do. This garlic bagel tastes best when it’s toasted because it get’s rid of the cake like texture. The butter in the batter gives them a nice buttery taste as well. So, you won’t have to add any additional butter or cream cheese. 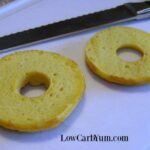 If you don’t have a donut pan, you may want to try the coconut flour fat head dough recipe instead. It’s a thicker dough that holds it shape while baking. Low carb foods can get expensive. Making these gluten free bagels at home is much cheaper than buying pre-made ones. They taste delicious too! Blend together eggs, butter, salt, and garlic powder. Combine coconut flour with baking powder and guar or xanthan gum (if using). Whisk coconut flour mixture into batter until there are no lumps. Bake at 400 degrees F for 15 minutes. Cool on rack 10-15 minutes then remove from pan. Adding in a small amount of psyllium husks may give them less of a cake-like texture. And, if psyllium is added, eggs can be reduced. [post_content] => Low carb foods can get expensive. Making these gluten free bagels at home is much cheaper than buying pre-made ones. They taste delicious too! GREAT RECIPE!, COULD I PUT THIS IN LOAF PAN & MAKE IT SANDWICH BREAD OR AS HAMBURGER BUNS?. Some have made buns instead and I seem to recall another person doing a loaf, but it might have been in a small loaf pan. So either should work. Lisa, I tried the bagel recipe but made some changes. I put in 2 tbsps. of psyllium husk powder and reduced the eggs by 2. They were not cakey but a little doughy inside. My husband tried one and said it was ok (a compliment from him). The batter was not a batter but a dough. I think they turned out fine. I may try using 5 eggs next time just for curiosity’s sake. I also may try a cinnamon pecan strudel! Thanks for the recipe and the modifiers. Psyllium is a good way to thicken the batter and replace eggs. Maybe it wasn’t fully cooked? Usually, a little liquid is added along with the psyllium. How long will these stay fresh for? I keep them in the fridge for a week or the freezer for several months. Modified a bit based on others’ comments. Sesame seeds on top before baking. Quite good once they cooled, cut in half and toasted!! Especially tasty with a little maple syrup poured on a plate (not too much) and let it soak into the bottom a bit. Thanks for sharing the changes! 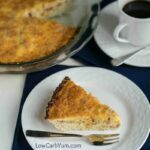 The whole point of the original recipe is to make it low carb so it could be suitable for keto diet. Using some quinoa flour here completely ruins it and it goes against the core idea of this website. Medium carb bagel makes as much sense as mid-grade fuel. Why would anyone need it? These came out perfectly delicious!!! Thank u! What does xanthum gum do? Do the bagels come out that much better with it? It’s added to give a more elastic texture, but you can omit it as it’s not an essential ingredient. 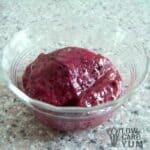 Hi Lisa – Have you tried the recipe with psyllium husk and/or oat/flax fiber yet and how did it turn out? Did you happen to post a recipe? You can replace some of the eggs with psyllium eggs (about 1 tablespoon psyllium to 2 tablespoons water). That’s how I’d try it. I found them a bit eggy and too cake like to be a bagel. So play with the recipe. I’ll play with it some more. You can use all egg whites to get rid of the egg taste. Using a mix of almond and coconut flour will make it less like cake. How much flax (seed or meal?) would you add to give it more of a “whole grain” taste? You wouldn’t need much. I’d say a tablespoon would be enough. I find it gives a more whole grain texture and taste. Do you think this recipe can be made by substituting the coconut flour with Carbquik? You’d have to make other changes. You are better off modifying the CarbQuik biscuit recipe. 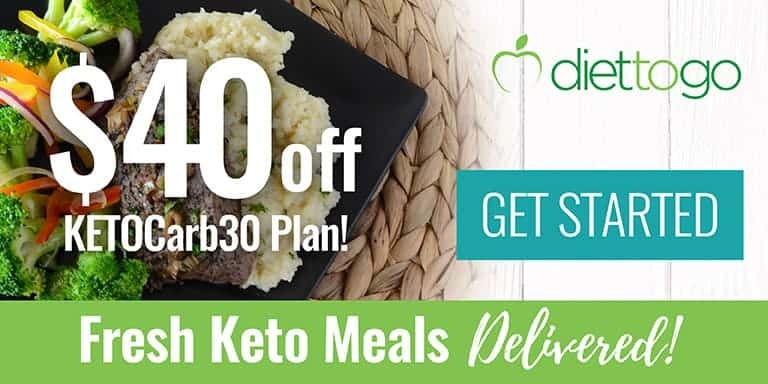 I’d love to know what your menu has been like to lose weight again? 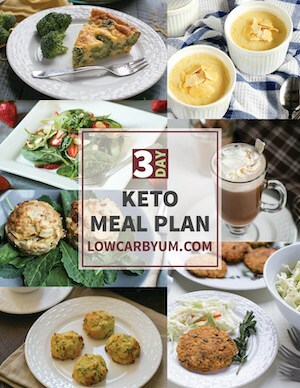 I’ve been eating Keto for a year and just recently started gaining weight again. Thanks for the recipe! Like many, I tend to gain a bit over winter and slim down each spring. When I’m trying to lose weight, I eliminate the sweets. Even low carb ones tend to affect me weight wise. I think it’s because it triggers hunger for me and I’ll overeat. I do eat a lot of eggs, butter, bacon, venison, brown meat chicken, coconut oil, and low carb veggies. I also try to stick with whole foods. I made these tonight and was pleasantly surprised with the outcome. While I enjoy coconut flour I wish there were some way to tame down the taste in some recipes. Definelty not a true “bagel” but satisfies the bread desire. I think the only way to tame it down is to blend it with another low carb flour like almond meal. You mentioned that you particularly like them toasted. Did you toast them in a regular toaster or in the oven? I’m hoping to try these as soon as I get a doughnut pan. Thanks! I just slice them like a regular bagel and put them in the toaster slots. So these do not work AS BAGELS without the donut pan. I made them with 5 eggs & cream cheese & omitted the gum. They look fine when you spoon them out on a cookie sheet but they spread out like pancakes in the oven. The flavor is awesome. The texture is very similar to cornbread. I think next time I will buy the pan or make them as muffins or in a pie pan. I just crumbled some into a bowl with smoked salmon, cream cheese, & some sautéed spinach. It was so good & a nice change from eggs. Definitely a keeper as it really satisfies the bread craving. The batter is certainly not suitable to bake without a baking mold. Adding psyllium may do the trick, but I haven’t tried it. Glad you enjoyed them even though they flattened! I saw that someone used 5 eggs and 2 oz of cream cheese instead of 6 eggs so I tried that as well but I used egg beaters instead of cracking eggs, my bagels turned out HUGE, I didn’t alter anything else in the recipe. Do you think this is from using the egg beaters? It could have been. I’ve never used egg beaters. Do they contain anything other than eggs? I really am not sure, but they turned out very “eggy” they had a weird egg texture. I will try again and not be lazy and use real eggs! I’ve frozen similar bread and it was still tasty when thawed. Can you use flax seedb to replace some of the eggs? You can certainly try. I don’t have any experience with it, but it’s worth a shot. You could try chia seeds as they are a known replacement for eggs. Ok they are in the oven as we speak. Did not put the garlic in. Instead I put some Montreal steak seasoning on top to approximate an everything bagel. Couldn’t find the donut pan so used a cookie sheet spread them out and used the end of a wooden spoon to make the hole. I am waiting w cream cheese and ground peanut butter (only peanuts and salt) in hand. Yay!! Sounds interesting. Hope they came out tasty and worthy of the spreads! I’ve made them twice in the last 2 weeks. First batch I made I didn’t have the xanthan gum. They didn’t rise too much, but they were good. one egg with 2 oz of cream cheese. The cream cheese made them moister and more delicate. 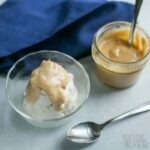 I love this recipe and will keep using it! Thanks for tip on replacing an egg with cream cheese! I have to try it! Can i skip the gum in the recipe? It’s kinda hard to find where i live. Others have been successful leaving it out in similar bread recipes so it should be fine. It may not be strictly necessary, but if you leave out the gum, I’d recommend separating your eggs. The yolks can go into the batter like normal, but try whisking the whites into a froth before folding them into the batter. I bet it makes a difference. Hmm, maybe I’ll try that trick myself. Interesting. I’ve never tried that. Would love to know how it turns out. Hey, this recipe looks like a Godsend! Of all the carbs I miss, bagels are the strongest yearn! Do you think I could sub almond flour for coconut flour? Not sure what the exact amount would be for almond flour, but my guess is that it would need about a cup. May also need to reduce eggs. Other changes may also be required like reducing butter and adding baking powder. It’s usually not a one for one subbing almond for coconut flour. Can I sub coconut oil for the butter? It will alter the taste, but otherwise should be fine. Just made these. Great bread stand in! Happy to hear the recipe worked out for you. 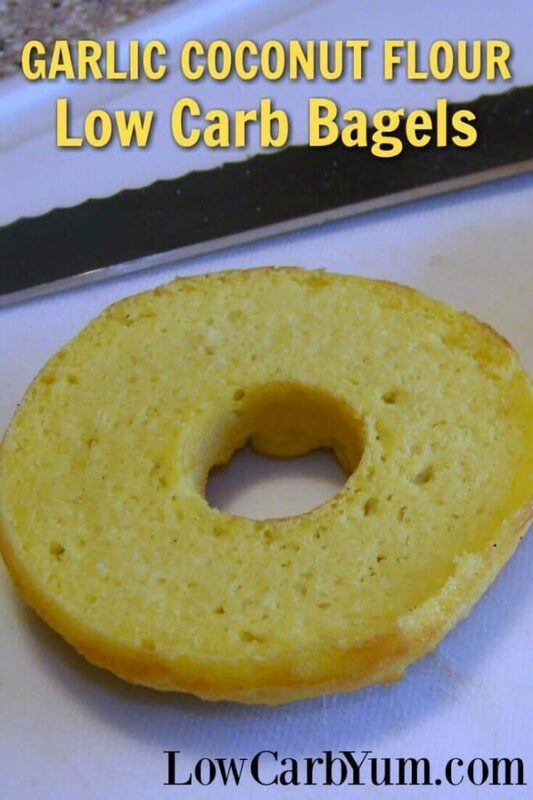 This is my favorite homemade bagel recipe. You may have just answered my prayers! I have to watch my carbs (doctor’s orders) and haven’t had bread in months. It’s starting to get to me when my co-workers toast anything at work. It smells soooo good. These bagels look fab. I can’t wait to try them! I really enjoyed these bagels. They make a good substitute and should be able to get you through the cravings at work. oh that sounds amazing. Do you have a recipe for that pizza crust? I like these a lot! I made them earlier today, and with some leftover meatloaf, had a meatloaf sandwich for dinner — very good! Must say that I tried this as pizza bottom, added some Italian spices and the garlic powder and spread out on silicon mat on cookie sheet. pre-bake and then top with fav. toppings. My whole family loves it!!!! Asa- Thanks for sharing the idea of turning this into pizza crust. I will most definitely give that a try. Not to bad. I will also leave the garlic out and mix in fiber too. I think I may skip the garlic next time too and add a little flax or oat fiber to do a more “whole grain” type bagel. These look sooo delicious and I can’t wait to try them. Any ideas as to what can I use instead of a donut pan – don’t have one and even if I did it wouldn’t fit in my little counter top oven – no big oven at this time :(. Thanks! The batter is really thick so you could just drop them like biscuits onto a baking sheet. If you flatten them out in little circles, they could be like English muffins. Or, try shaping them into bagel rings on a baking sheet. These ideas would be worth a try if you don’t have room for another baking pan. This is by far the best recipe yet that I have come across that has a mouth-feel of regular bread/bagel! 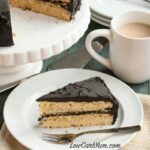 I am definitely bookmarking this recipe!! !